Engineering Entrance Exam Calendar: The B.Tech Admission Test is conducted for admitting the willing and deserving candidates into the various engineering colleges or universities all across the country. The candidates who have passed class 12th with Science and maths as a subject are eligible to apply for the Engineering Entrance Exams. It’s a very complicated task for the candidates to opt the best engineering college for carrying their engineering studies. We are here to make you available with the rank and popularity wise colleges in each state. You will be able to access the complete schedule of all the important entrance exams to be held in the year 2017. The notifications of entrance exams are generally published on the offici al website of the respective university or exam conducting authority. Students are advised to stay connected with us for latest and timely notifications of the various state wise engineering entrance exams all across the country. It is very crucial for all the candidates to analyse the inbuilt capabilities of a candidate in which he/ she is most suited before deciding the career stream in which the candidates have to carry their engineering degree. The list of the entire major engineering entrance exam has been prescribed below. You are advised to check the list below for the complete Engineering Entrance Exam Calendar 2017. Engineering is one of the most reputed undergraduate degrees that is carried out into 04 academic years. The candidates who want admission in various engineering colleges situated all across the country are needed to qualify the engineering admission test. Various universities/ colleges conduct their respective entrance exams on the university/ state/ national level. 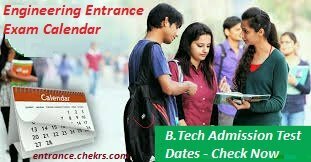 The list of various engineering admission tests are given here, you can check the B.Tech Entrance Test Calendar 2017 described above. For any type of assistance, while choosing the most appropriate college for carrying the B.Tech degree, you are invited to contact us by commenting at the end of the post, we will respond you as soon as possible.